Google.co.uk or Google.com which do you prefer? When the moment strikes and you need to 'google' something, which address do you type into your browser? Is it Google.com, Google.co.uk or is it a totally different country's domain? With Google offering over 160 different domains across the globe there's plenty of options to choose from when you're in need of an instant answer to a burning question. Google is constantly acquiring new domains for smaller countries or regions and now offers users their own sites in overseas British territories and dependencies such as Google Jersey, Google Guernsey, Google Gibraltar and Google Isle of Man. Of course these sites are unlikely to gain huge amounts of traffic, but if your site or business is based in one of these areas then you could potentially attract a far more relevant audience. How do others see Google? If using the Google Chrome browser, people from the UK will automatically be taken to Google.co.uk. 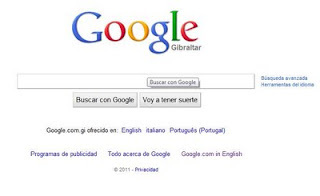 However, it is possible to select 'Go to Google.com' to obtain what is considered a 'Global search'. If selecting a foreign domain, users are also given the option of different languages on the homepage. For instance, Google.je is also offered in French - presumably due to its geographical location. Although you may be led to believe that using a different domain to search will show you how Google appears in that specific country, this is not the case. Google is far more complex than that. Because Google can identify and take into consideration your geographical location it tailors results accordingly. So, if you use Google.com to search for something in England you will still return different results from someone who uses the same key term in the US. This can pose an issue for businesses who trade in foreign countries but are based in the UK. Supposing your business sells in the US and you'd like to see how you rank for your key term in America - If you simply type your key term into Google you are more likely to return results relating to the fact you are in the UK. So how can you view Google in the same way that your American friend can, without catching a flight across the Atlantic? Again, clever Google has created an option for doing this. If you type &gl=US at the end of your search URL, for example, you will be able to see how someone in America would see your search. This is a really good technique for assessing where your key terms rank in other countries. The fact that Google offers domains for smaller territories offers a great opportunity for companies based in these regions, or who trade there. Make sure you don't miss out. We spend our days absorbing and applying the latest updates in the world of digital marketing to the work we do for our clients. If you're puzzled by Google and how to make your business stand out from the crowd, sign up to our updates and get our latest and greatest content straight to your inbox.